Tony Judt disliked the grand title “public intellectual,” even though he embodied it to the last day of his life. Judt (pronounced “Jutt”) was a professor of European history at New York University who died of Lou Gehrig’s disease at age sixty-two in August 2010. Before his death he rose to great prominence on two fronts. First, he published in 2005 the magnificent, comprehensive Postwar: A History of Europe Since 1945, a book encyclopedic in its learning yet engagingly written and argued. The pinnacle of his career, it quickly became one of the most celebrated works of history in recent years. Second, Judt contributed dozens of bracing, relentlessly clear, and frequently provocative essays to the New York Review of Books, his intellectual home. His audience was more receptive to some of his arguments than others. Judt’s harsh critiques of unrepentant communist thinkers like Eric Hobsbawm and Louis Althusser, and his championing of European-style social democracy, put Marxism firmly in its place while articulating a strong, practicable vision for the left. Yet his equally withering assessment of the Middle East crisis—“two peoples, each sustained by its exclusive victim narrative, competing indefinitely across the dead bodies of their children for the same tiny piece of land”—earned him an excommunication from The New Republic and the enmity of many of his fellow Jews. Judt thrived on debate and, when attacked, swung as hard as anybody. Yet no matter how strong his opinions, he never seemed shrill or defensive, and always retained a scholar’s eye for evidence, precision, and clarity. As an English-born student of European history teaching in the U.S.; as a Jew somewhat uncomfortable with much that passes for “Jewishness” in contemporary America; as a social democrat frequently at odds with my self-described radical colleagues, I suppose I should seek comfort in the familiar insult of “rootless cosmopolitan.” But that seems to me too imprecise, too deliberately universal in its ambitions. Far from being rootless, I am all too well rooted in a variety of contrasting heritages. Those heritages shine through in the many books and essays of Judt’s final years. There are shadows of postwar England, France in the 1960s, and life in New York City, as well as Europe’s trains, bad English and Jewish cooking, and an austere school life. Unsurprisingly, Judt’s heritage was intellectual as well as geographic: he was strongly influenced by liberal, anti-totalitarian writers like Arthur Koestler, Albert Camus, and George Orwell. By the standards of the academy, Judt called himself “a reactionary dinosaur” who “[has] little tolerance for ‘self-expression’ as a substitute for clarity; regards effort as a poor substitute for achievement; [and] treats my discipline as dependent in the first instance upon facts, not ‘theory.’ ” His book Past Imperfect: French Intellectuals, 1944–1956 called to account a generation of trendy apologists for Stalin. He deplored the jargon of the humanities as a mask of insecurity over a lack of anything useful to say. Yet in any roundtable debate outside the academy’s halls—that’s to say any mainstream venue—Judt unfailingly represented the liberal perspective, well to the left of most American Democrats. A vocal opponent of privatization, gated communities, globalization, and market orthodoxies, he despaired of our current crop of leaders, especially Bill Clinton and Tony Blair—“the gnome in England’s Garden of Forgetting.” Although he often criticized American foreign policy, Judt eschewed knee-jerk anti-Americanism; Postwar blames the Cold War on the Soviet Union. His ideal statesman was the boring but stolid Labor Prime Minister Clement Attlee, who turned Britain in the late 1940s into a land of social democracy and welfare protections. Judt approvingly described Attlee as “modest in demeanor and wealth,” as well as “morally serious and a trifle austere”—a public servant rather than a slick media manipulator or underlip biter. The rare benefit of a historian like Tony Judt is our ability to audition him on topics with which we are already familiar. When deciding which history of Europe to read, we can road-test him, as it were, in a way we cannot do with other scholars. After all, academic history is just an analysis of yesterday’s developments; one who analyzes today’s events poorly should be avoided. Most readers will have an opinion on and a passing familiarity with the facts of the Iraq War, for instance. They can look up Judt on that topic and evaluate his intelligence, his writing, and his judgment. On all three indicators he consistently scores very highly. On the first, Judt was unquestionably brilliant. In Postwar, for instance, he ranged with great facility over topics as diverse as agrarian and trade policy, French and Italian cinema, the politics of the Soviet bloc, and the economics of European integration. Such erudition would be meaningless without clear writing and presentation, and Judt more than passed this test as well. You will not find a contemporary historian with crisper prose. Here is a pedestrian but representative example: “The point of a midlife crisis is to demonstrate continuity with one’s youth by doing something strikingly different.” As for his judgment, one may not always agree with Judt’s conclusions—he emphasized the inequality produced by markets without heeding the wealth they create for all, and was too unruffled by Islamic terrorism. But it is hard not to respect his methods, which prized reason and evidence while avoiding fashions and fads. His views on Israel may be best understood in this light: Judt was well situated to explode myths and shatter glass houses because he disdained all myths and all glass houses. Any government bulldozing homes would come under his glare, regardless of the circumstances. Firstly … there is no loss of sensation (a mixed blessing) and secondly … there is no pain. In contrast to almost every other serious or deadly disease, one is thus left free to contemplate at leisure and in minimal discomfort the catastrophic progress of one’s own deterioration. In effect, ALS constitutes progressive imprisonment without parole. More remarkably still, Judt wrote the fifteen interconnected vignettes of The Memory Chalet in his head during the night as an antidote to insomnia and a bulwark against insanity. His description of the interminable night is painful to read: a dead weight, he could not shift positions, scratch an itch, or use the toilet without assistance. Once he realized that he was mentally composing stories rather than drifting off, he employed the mnemonic device of the rooms of a house—“this drawer follows that closet on that wall”—to recall and store scenes from his past for use in the next day’s writing. (The house was a chalet in Switzerland, the scene of a favorite childhood holiday vividly remembered.) The result is a book that stands above the false stakes and canned nostalgia of most memoirs both in its authenticity and its urgency. Writing literally kept Judt alive: The Memory Chalet was an effort to get everything onto the page before dying. It is a beautiful book that invites the reader into the most intimate spaces of his mind, which chugged briskly along even as his body was a train lifting slowly off the tracks. I am fast losing control of words even as my relationship with the world has been reduced to them. They still form with impeccable discipline and unreduced range in the silence of my thoughts—the view from inside is as rich as ever—but I can no longer convey them with ease. Vowel sounds and sibilant consonants slide out of my mouth, shapeless and inchoate even to my close collaborator. The vocal muscle, for sixty years my reliable alter ego, is failing. The book reveals Judt as something of a conservative with a small “c.” He frequently yearns for the sturdier stuff of the postwar years. One chapter recalls with fondness a childhood home in Putney, a southwest district of London, with its row upon row of homogeneous houses that may not have been glamorous but were “reassuringly middle class.” He mythologizes a tough and politically incorrect schoolteacher, and pines for the days when proper English, syntactically precise, was a standard to which all aspired. Judt’s outlook—like anyone’s—is tethered to the place and time of his upbringing, and he is of the view that we need fewer gadgets and more teapots built to last. Although America became his adoptive home, these sentiments of conservation and acceptance of the good-enough are very British. For better or worse, they seem to have little place in the land of super-sizing and Hummers, where the individual reigns supreme in both imagination and deed. 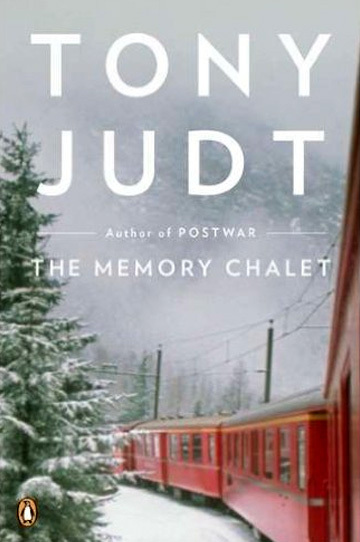 Deeply personal, The Memory Chalet occupies a unique place in Judt’s oeuvre. Yet in an important respect it is consistent with and even a vindication of his life’s work. One of Judt’s most animating topics was humiliation. It appears frequently in his books and essays. World War II, he writes in Postwar, was above all experienced “as a daily degradation, in the course of which men and women were betrayed and humiliated, forced into daily acts of petty crime and self-abasement, in which everyone lost something and many lost everything.” Judt was critical of Israel in part because its cocky young soldiers frequently humiliated Palestinians, pointing guns at their elders and turning them into refugees living in slums. A scene in The Memory Chalet recounts with feeling an incident in which a group of privileged students at Cambridge University humiliated their “bedder” (house matron) by cavorting around naked on the lawn with girls and refusing to make to her even the show of decorum that generational and class differences demanded. In his concern for humiliation, Judt shares the excellent company of another great twentieth-century liberal: Justice William Brennan, whose life’s purpose was to in- terpret the U.S. Constitution in a way that protected citizens’ dignity. Judt himself learned a thing or two about dignity in his last years. Helplessness, he writes in The Memory Chalet, is humiliating—and his helplessness grew with his disease’s progression. Relying on handouts is also humiliating—be they clothes, rations, food stamps, or charity checks. Judt saw welfare protections as an antidote to the scourge of humiliation, and as his own helplessness grew complete he championed social democracy as the most important lesson of a lifetime’s study. His personal circumstances seem to have confirmed a long-held belief that in the public sphere, humiliation is a barometer of broken societies, and that communities ought to take steps and make sacrifices to avoid it for their members. To Judt, the social safety net of a Sweden or Denmark is not just money pried from the hands of the rich and spread around. It is an investment that members of a society willingly make in each other, and in future generations. In today’s sad state of public discourse in America, this emphasis on caring for one another probably would earn Judt the label of socialist. That at least has been the rhetorical response to President Obama’s noble and important effort to reduce the number of Americans who sicken and die because they cannot afford health insurance. But as Judt’s writings show, he was no socialist; he scorned those who clung to Marxism in the face of history’s lessons. And yet as he observed a world pointed the wrong way, his enthusiasms ultimately outpaced his scorn. Even as he lost everything to illness, he sounded an optimistic note: to be stricken with ALS with “a well- stocked head” and a mind in good working order was something “close to good fortune.” To have such an eloquent record of the experience is ours.